Visit San Diego Gaslamp Quarter Visit California this October for the City's #1 Halloween Club Celebration. San Diego Zombie Crawl is a 3-day Adult Trick or Treating experience like no other. Why choose 1 party when you can enjoy 20 for the price of ONE? Begins at American Junkie San Diego on all 3 days. 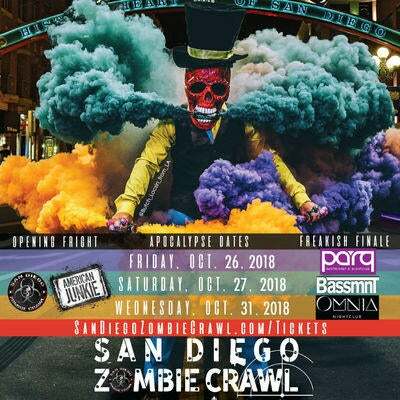 We look forward to welcoming you to San Diego Zombie Crawl this Halloween!